On 17 August, the inaugural Australian Education Awards were held at The Dockside Sydney with the best principals, teachers, heads of department and schools revealed. Queensland’s St Paul’s School made a big impression, picking up four trophies on the night. 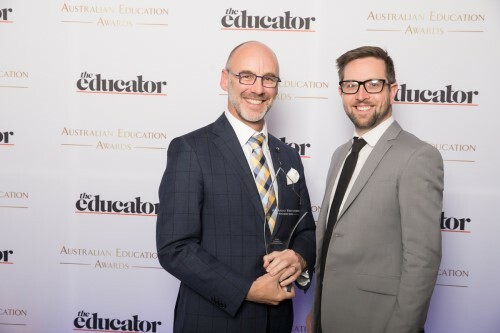 Principal Dr Paul Browning (pictured left) won the School Principal of the Year – Non-Government award, while his school picked up trophies in the categories of Innovation in Curriculum Design, sponsored by Atomi, Best School Strategic Plan and Best Professional Learning Program. The awards topped what has been an impressive year for the school. In May, St Paul’s School was recognised as one of the world’s top 100 innovative educational institutions by one of the University of Cambridge’s most influential bodies. Dr Browning attributes a large part of his school’s success to its Realms of Thinking project. The Realms encourage your child to imagine and aspire to any possible future, from starting and shaping a business before they graduate; applying design thinking to real-world problems; and collaborate through global connections of learning and friendship. In 2014, the school did a scenario planning project which looked at four possible futures of the world of 2028 when the school’s youngest students will be in Year 12. “A part of this process was interviewing experts in a whole range of fields, such as politics, economics, religion, technology and education, and they helped us identify emerging trends and critical influences,” Dr Browning told The Educator. The school created four “stories of the future” then looked at how it would need to position itself educationally to meet the challenges – one of which was the looming automation of the workforce. “A lot of jobs will be replaced by robotics and artificial intelligence, and all of the new work that will emerge needs high levels of creativity,” Dr Browning said. Dr Browning said the program is important to ensuring young people are “able to thrive in the world of tomorrow”. “If kids are going to be successful in tomorrow’s world, they need to be able to think creatively,” he said. Dr Browning said educators are helping to craft the next generation of innovators, leaders and entrepreneurs. “The future of our nation really depends on the quality of the teachers in our classrooms,” he said.